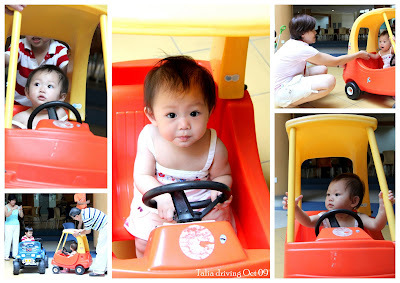 Ethan and Talia's World: Birthday Bash! 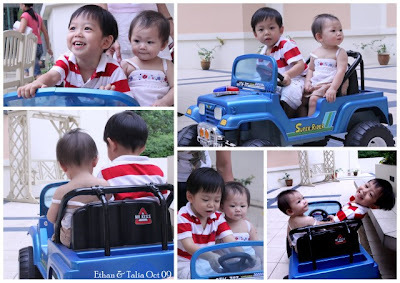 Ethan & Talia turned 3 & 1 ! Their birthdays are just 2 weeks apart so we had a combined birthday party for them on Children's Day. 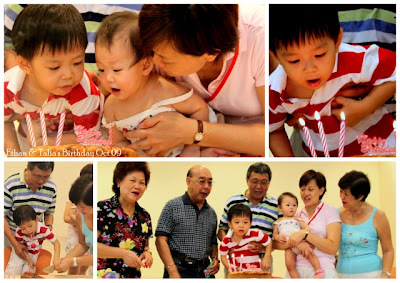 The kids loved the cake that was lovingly baked by Ah Mah, and Ethan helpfully blew Talia's candle out for her! 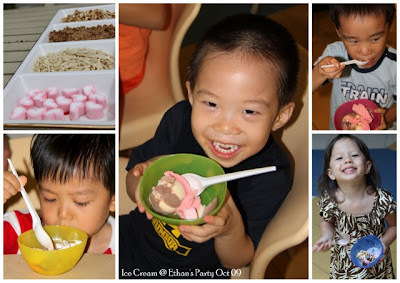 We had a simple Ice Cream party and with help from Aunty Sharon & Aunty Cheryl, it was quite a bit of fun for the kids. The Birthday Boy certainly had a great time at his own party. 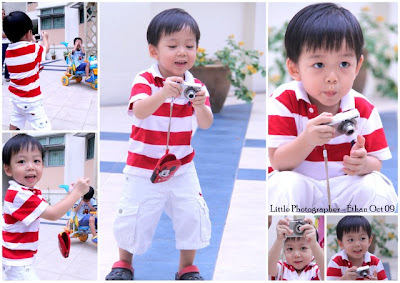 Aunty Sharon lent him her camera and he had a great time snapping away! But the highlight of the party was probably when all their friends came along bringing their favourite bikes, cars and scooters and the ensuing excitement of running, driving, chasing and screaming that followed! 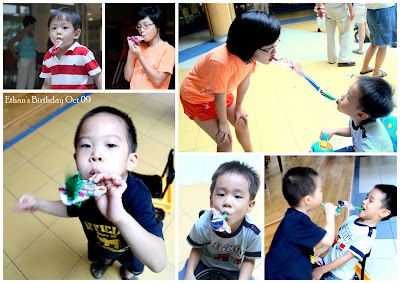 Daddy's party-blowers were quite a hit too! The kids loved them and discovered the new skill of multi-tasking -- cycling while blowing them and using them to flick passing kids! 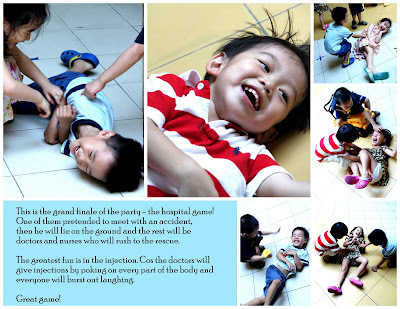 It was quite hilarious to watch the kids having a crazy time with each other and thanks to Aunty Sharon who captured these moments on her camera. Although it was exhausting preparing for the party it was also very heartwarming seeing the kids having such a memorable time together. I'm really grateful for the warm support of our families and feel very blessed for the friendships that we and our kids have here. Happy Birthday Ethan & Talia! May you always be surrounded in the warm knowledge that you are deeply loved!